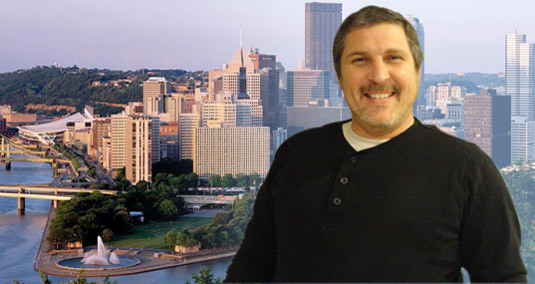 Under the supervision of master plumber Alan Urszuy, we bring nearly 30 years of experience to the delivery of experienced 24 hour plumbing company Baltimore services to the Greater Baltimore area. Our company installs and repair water lines, faucets and sinks, drains, pipes, water heaters, boilers, sump pumps, septic tanks, and the outside sewer line. We unclog drains and toilets. Call 24/7 Sat night – Friday afternoon to arrange for our expert plumbing company Baltimore service. Kitchen and Bathroom PlumbingOur company offers installation, repair, and maintenance of all plumbing fixtures, including faucets, sinks, tubs, showers, and toilets plus the plumbing end of remodeling. Alan is a seasoned expert in plumbing remodeling. With his company on the remodeling team you can be confident that all fixtures will line up perfectly with the plumbing pipes. Alan applies the same level of expertise and care to sink installation and repair jobs and faucet repair and replacement assignments. If you need a new toilet or new shower or tub, Alan’s company can help you with selection as well as installation. He is a seasoned expert when it comes to choosing the appropriate low flush toilet or low flow shower head for your bathroom. His bathroom installs are leak proof and Alan is just as effective in troubleshooting a leaky shower, tub, sink, or toilet. His company has years of experience unclogging clogged toilets, and repairing broken toilets. If you have a problem with bathroom odors coming from the toilet, shower, or tub, 1st Choice Plumbing can help. Are you bothered by gurgling noises in your toilet? This may be a sign that your roof vent is clogged. Our company recognizes all the signs of a clogged roof vent and offers rapid outdoor repair service. Drain Cleaning: Our company cleans, unclogs, and repairs all drains in the home. 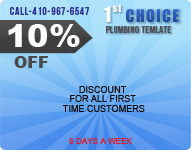 The staff of 1st Choice Plumbing, a plumbing company Baltimore are drain cleaning experts. We offer our customers a $69 dollar drain cleaning special. If you hire us for one other plumbing job, our company will unclog one drain, provided it has a convenient access, for only $69! On every drain cleaning assignment we utilize a professional plumbing auger or a video inspection camera as needed. Our company’s fully equipped staff is able to clean any type of obstacle from the drain including lost jewelry, sanitary napkins, objects accidentally pushed into the drain, or built up grease and grime. We can efficiently restore the water seal in a broken “P’ trap or “J” trap and thus prevent the backflow of harmful sewer gases into your bathroom or kitchen. Our company recognizes all the signs of messed up pressure changes in your pipe and know when it is essential to check the vent line, and make sure it is working properly. Sewer and Water Main Cleaning and Replacement: Our company cleans, repairs, and replaces water mains and the main sewer line from the home. Our Baltimore plumbing company’s reputation for excellence and ability to get the job done has won us contracts from HomeServe, a leading provider of home repair and sewer repair insurance. 1st Choice Plumbing Inc. is a Baltimore sewer contractor, and our company handles all aspects of sewer replacement including arrangements for heavy duty equipment rental (trenchers). We will help you make the most precise decision as to whether to go with a trench or trenchless sewer repair, including balancing the added cost of the trenchless repair with the cost of repairing above ground structures after the Baltimore sewer installation is finished. If you want a trenchless sewer repair, our company will help you compare the advantages of sewer pipe busting versus sewer pipe lining. All our sewer replacements come with a lifetime guarantee on the new sewer line pipe. If you have sewer root problems, our company has an excellent Baltimore sewer maintenance package. We can come out once or periodically and chop up all the roots in your sewer. At the first visit we will evaluate your sewer and let you know if it can be maintained with periodic cleaning or if it kneeds to be replaced. If your sewer is backed up and you’re not sure whether the blockage is on your property or municipal property, call our company and a plumber will come out and do a free evaluation. Baltimore Water Heater Installation and Repair:Our company services and replaces all types of water heaters and combination heater-boiler, maintenance plans are available. Our company troubleshoots for all types of problems in gas powered water heaters or electric powered water heaters. Typical gas powered heaters problems that we repair include faulty gas pilot, faulty gas thermocouple, faulty gas pilot control valve, inadequate hot water production, rust colored water, rotten egg smell in hot water, rumbling sound in the water heater, or leak around the water heater base. Inadequate hot water may be due to undersized unit for home, broken or damaged dip tube, crossed hot and cold water connections, gas supply or gas control problems. Rust colored water may be coming from tank corrosion or a failing sacrificial anode rod. Hot water with a rotten egg smell may be due to bacterial buildup in the tank. A low popping sound may result from sediment buildup in the tank. A water leak around the base may be coming from a faulty T& P valve, internal buildup of excessive pressure, or a corroded tank. We will troubleshoot and repair each of these problems. Our company’s typical Baltimore electrical water heater services include checking the upper and lower heating elements, replacing the upper or lower heating elements, testing and replacing the hot water heater thermostat, flushing out or replacing the pressure relief valve, fixing or replacing a water heater drain valve. We repair all major water heater brands and can assist you with selecting a new water heater. Our company repairs, services, and installs gas and electric tankless water heaters. We install point of use tankless water heaters. And we can help you select the most energy efficient tankless water heater units. Baltimore Pipe Line Repair and Baltimore Gas Line Repair: 1st Choice Plumbing is experienced in all types of plumbing pipe repair. During the winter months, freezing temperatures commonly cause ruptured plumbing pipes that leak after the thaw. Our company will help you thaw your frozen pipes, or drill through ice impacted lines, if needed. After they are thawed we will repair and replace them as needed. At other times of the year, corroded pipes are the major cause of pin-hole or else repetitive plumbing leaks. OUr company will detect the source of the leak, examine the pipes and let you know whether the pipe can be repaired or must be replaced. We will do video inspection of your pipes as needed to find the leak. If your pipe system is badly corroded and repeatedly leaks in different locations, our company will recommend pipe replacement or re-piping. We will give you an estimate and handle the whole job, which takes several days. You will actually only be without water for a short time. Signs of corroded pipes include rusty water at the tap. If you have hard water and live in an older house your pipes may be narrowed due to sediment buildup. The symptoms are reduced pressure at the upstairs taps. We will inspect your pipe system and tell you if you need whole house re-piping. When you need to replace your pipes someone from our company will talk with you about the advantages of getting PVC piping or copper piping. We can even help you with pipe winterization to avoid frozen pipes. Call us at 410-967-6547 for more information about our plumbing pipe repair Baltimore services. Gas Line Repair Baltimore – Our company is directed by a licensed expert in gas line repair. If you have a gas leak from one of your plumbing appliances one of our company employees will offer you emergency gas line repair services. If you need to install a gas powered appliance, such as a boiler, tank water heater, or tankless water heater, our staff will provide professional installation of all gas lines needed to run the appliance. Baltimore Boiler Service: Our company offers boiler installation, boiler repair, and boiler maintenance. We also have an annual boiler maintenance and repair package. We repair and maintain all parts of the home hot water and steam heat system including radiator repair, hot water and steam pipe repair, and baseboard heating systems repair. Our company services include annual flushing of your hot water and steam duct system, and replacement of defective radiator valves or other parts. Common boiler problems our company repairs include loss of pressure in the system, thermostat problems, corroded and or blocked pipe work, and a boiler that is too small to provide adequate heat for your home. We will help you decide whether to repair or replace your aging boiler. Our company will diagnose your boiler’s current problem and decide whether it can be fixed or not. We will look at the availability of parts for your model to help determine the likely cost of repair now and in the future. Our company will examine the trend of your boiler repair bill over the last several years. We will consider the energy efficiency of your older boiler and whether or not it is a condensing boiler. This way our company staff will be able to determine how much money you can potentially save by buying a more energy efficient boiler. If our company decides together with you that it is time to get a new boiler, we will help you select a model with the level of energy efficiency that is right for your home and pocketbook. Spending more now, if you can afford it, will pay off later on as annual energy savings compensate for the initial extra outlay. A boiler with the Energy Star approval label is in the highest class of energy efficiency and guaranteed to save you are least 13%-19% on monthly energy expenditures. Basement Flooding and Sump Pump Repair Baltimore: Our company offers sump pump installation Baltimore and sump pump repair Baltimore services. When selecting a sump pump, it is essential to choose one with enough pumping power and capacity to keep your basement dry under the worst case scenario. Our experienced company technicians will assist you in choosing a sump pump that meets your personal needs. We will walk you through the 4 essential sump pump selection questions: 1) Do you want an above ground or submersible pump? 2) How much pumping power do you need for your basement (the calculation is based on your basement’s “system capacity and sump pump outflow “dynamic head”)? 3) What sump pump brand do you want to purchase? 4) What type of back-up sump pump do you want to buy, i.e., a unit connected to the main pump or separate? Purchasing a back-up sump pump is an essential part of basement plumbing prevention. Many times, a powerful storm will bring lots of rain and will also knock out your electricity. Your main sump pump will fail, and if you haven’t installed a back-up you will be left with no sump pump support at a time when you most need it. Our company offers regular sump pump maintenance. Even a good sump pump setup will go bad over time for many reasons. Hire our company to come out and inspect your sump pump or call us at 410-967-6547 about our free annual plumbing maintenance inspection and get your sump pump inspected free of charge. Free Annual Plumbing Maintenance Inspection: Our company offers a once a year free annual plumbing inspection. Call 410-967-6547 to ask about this special offer.